This post is an excerpt from Chapter 4 of the book CUDA Fortran for Scientists and Engineers, by Gregory Ruetsch and Massimiliano Fatica. In this excerpt we extend the matrix transpose example from a previous post to operate on a matrix that is distributed across multiple GPUs. The data layout is shown in Figure 1 for an nx × ny = 1024 × 768 element matrix that is distributed amongst four devices. Each device contains a horizontal slice of the input matrix shown in the figure, as well as a horizontal slice of the output matrix. These input matrix slices of 1024 × 192 elements are divided into four tiles containing 256 × 192 elements each, which are referred to as p2pTile in the code. As the name indicates, the p2pTiles are used for peer-to-peer transfers. 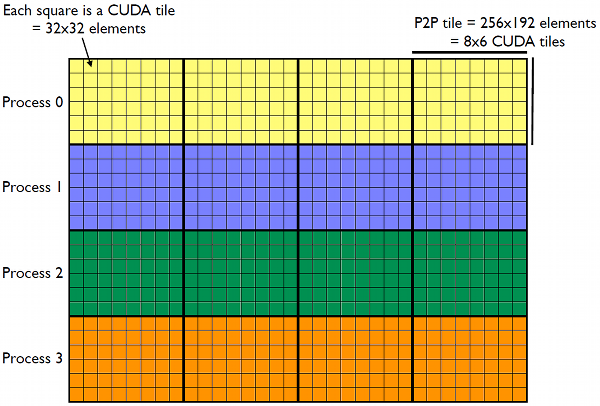 After a p2pTile has been transferred to the appropriate device if necessary (tiles on the block diagonal do not need to be transferred as the input and output tiles are on the same device), a CUDA transpose kernel launch transposes the elements within the p2pTile using thread blocks that process smaller tiles of 32 × 32 elements. Device data layout for peer-to-peer transpose with a MARKDOWN_HASH97893f46e7e13ef37b4c2e0ac60d85caMARKDOWN_HASH x MARKDOWN_HASH531beb50ffb32d08756e6462c037c8e1MARKDOWN_HASH = 1024 x 768 matrix on four devices. Each device holds a 1024 x 192 horizontal slice of input matrix (as well as a 768 x 256 horizontal slice of the output matrix). Each slice of the input matrix is broken into four tiles of 256 x 192 elements, which are used for peer-to-peer transfers. The CUDA kernel transposes this tile using 48 thread blocks, each of which processes a 32 x 32 tile. where the first index to streamID corresponds to the particular device the stream is associated with, and the second index refers to the stages of the calculation. The stages of the transpose, enumerated zero to nDevices-1, are organized as follows. 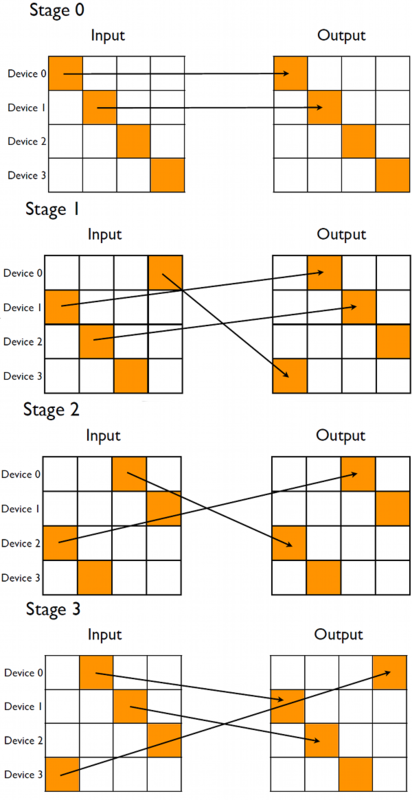 In the zeroth stage, each device transposes the submatrix that lies along the block diagonal of the global matrix, which is depicted in the top diagram of Figure 2. This is done first as no peer-to-peer communication is involved, and the kernel execution can overlap data transfers in the first stage. Stages of the matrix transpose. In stage zero each device transposes the block along the global matrix diagonal which requires no peer-to-peer communication. In stage one blocks from the first sub-diagonal of the input matrix are transferred to the device holding the respective block super-diagonal, after which the transpose is performed on the receiving device. Subsequent stages (such as stage 2) do the same for subsequent sub- and super-diagonals. The wrapping of the diagonals becomes more pronounced for subsequent stages, culminating in the last stage’s communication pattern being the reverse of the first stage. While both these numbers fall short of the effective bandwidth achieved in the single-GPU case, one must take into account that half of the data is being transferred over the PCIe bus, which is over an order of magnitude slower than the global memory bandwidth within a GPU. In light of this the use of asynchronous transfers which overlap kernel execution is very advantageous as can be seen from the results. In addition, typically the transpose is used as a means to some other operation that can be done in parallel, in which case cost of the PCI transfer is further amortized. 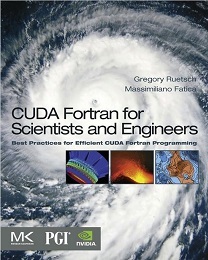 If you enjoyed this post, please check out the book CUDA Fortran for Scientists and Engineers, as well as the related posts linked below.